My father was a serial entrepreneur — he was always starting businesses. But more than that, he was a serial inventor, a master of DIY, an amateur everything. Built his own telescope — or tried to. Again, I can't remember if he ever finished the project, but I know that for years, he had a huge (12 inch? 15 inch?) and heavy hunk of polished glass the top drawer in his dresser. Wrote his own accounting software to manage his businesses. Dad bought an Apple II when I was in fourth grade (so late 1978?). Using the built-in Integer BASIC language (and, to some extent, the machine's assembly language), my father taught himself how to program whatever he needed. Note: I taught myself to program on the Apple II also. Starting in 1978 (when I was in fourth grade), I learned to type in the programs from various computer magazines. Since many of these programs were written for other kinds of computers, I had to teach myself how to modify the programs to my needs. And since Dad wouldn't buy any computer games for us, I had to write my own. Later wrote an entire suite of applications to run the box factory. When my father founded the box factory in 1985, he bought a new Atari 1040 ST computer and wrote all of the programs he needed in BASIC. He wrote programs for box layout, accounting, and more. 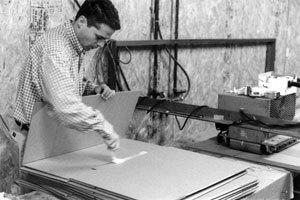 Note: The box factory continued using Dad's programs up until around 2001. Sometime during the late 1990s, our Atari ST computers began to die. Reading the writing on the wall, I taught myself Visual Basic on the PC and spent several months re-creating Dad's programs. We gave up the Atari ST when the 16-year-old external hard drive finally croaked. Designed an electronic, timed sprinkler system to run the irrigation in his failed nursery business. Designed, built, and marketed a line of wheat grinders and food dryers. Doing so, he built his first successful business, Harvest Mills. After five stressful years (and many gained pounds), he sold the business in the late 1970s. Created a second successful business, Custom Box Service, which he started in 1985. As I mentioned, he wrote all the computer software for the company, but he also built all of the manufacturing equipment by hand. Today, 25 years later, that equipment still powers the family business. When Kris and I decided in 1993 that we wanted to start our own vegetable garden from seed, my father helped me build a small greenhouse. We didn't use any blueprints; he was the blueprints. One long Saturday, we bought lumber and nails and plastic sheeting, and he stood around watching me, telling me what lengths to trim the two-by-fours and at what angles. He didn't sketch anything out on paper — he just told me what to do and I did it. That greenhouse is still standing. But all of these things barely scratch the surface. These are just the things I remember, and mainly his successes. My father did more: He wrote poetry (mostly bad poetry), played guitar, drew funny pictures, spent a couple of summers raising 40+ acres of wheat, flew airplanes, sailed boats, and more. When he contracted the cancer that eventually killed him, he bought a microscope so that he could draw his own blood and look at his dwindling supply of white blood cells. Well, I just finished reading an uncorrected proof of Mark Frauenfelder's Made by Hand, which is due to be published in late May. In the book, Frauenfelder — who is perhaps best known as the co-founder of Boing Boing and editor of Make magazine — chronicles his experience dabbling in the world of do-it-yourself (or DIY). The book includes chapters describing how Frauenfelder (intentionally) kills his lawn, grows food, raises chickens and keeps bees, brews tea and coffee, builds musical instruments, carves kitchen utensils, and, most of all, learns how to learn. The book isn't a practical guide to anything. You won't learn how to keep your own bees or carve your own kitchen utensils in Made by Hand; instead, you'll get the pleasure of watching over Frauenfelder's shoulder as he does these things. And, if you're like me, you'll be reminded of how much we, as a culture, used to do ourself. Frauenfelder believes — as do I — that the DIY ethic is only partly about the things you produce. It's also about learning how to learn, about connecting with others who share your interests, and about taking pride in your accomplishments. (Look! I built a personal-finance blog read by millions of people every year!) There's a reason Get Rich Slowly has a DIY category, even if it's seldom used: Doing things yourself is a great way to save money and increase happiness. Note: I'd love to provide a more detailed review of Made by Hand, but I can't. The copy I have is an uncorrected proof, and I'm sure things are going to change by the time it's published in a couple of months. Let's just say that I think the book is great, and I encourage you to pick up a copy if you're at all interested in DIY. My wife, who cooks and cans and bakes like crazy. (One reason I struggle with my weight is that Kris is always making terrific food.) But she does other creative stuff, too. Sitting next to me at the moment is a little stuffed animal that she made by hand. Chris Guillebeau and others who produce top-notch e-books on a variety of topics, earning good money while bypassing the traditional publishing industry. Courtney Woolsey, who started out singing for a few hundred folks on YouTube and now has a recording contract. My friends who play musical instruments. I love that Rhonda took up piano in her late thirties. Over the past two years, I've watched her move from rank beginner to competent learner. And I hope to see her progress even further. And, most of all, our friends' children. Craig's son, Albert, for example, loves electronics. His parents have fostered this, giving him all sorts of stuff to build and take apart. Other kids we know love to write, draw, do science, and more. It's great to see children innately drawn to DIY before they grow older and more complacent. The thing is, these folks are all amateurs (and so am I). They're not trained pros. They do these things because they love to, and this passion aids their performance. When they fail (as they inevitably do), they try again. (I think Craig has built his mud oven at least three times because it keeps falling apart.) These amateurs find ways to succeed, even if it's not a success in the eyes of the world. There are a lot of people who dislike amateur work because they think it's poorer quality than that put out by the pros. That's fine. I get that perspective. But for myself, I get much more value for my money when I pay five or ten bucks to see a community theater perform than when I pay fifty or one hundred to see a Broadway show. I'm not saying that you have to choose one or the other; I'm saying there's room for both. But for some reason, we've abandoned the stuff of talent shows and living-room concerts. I'd like to see more of that. I want to be awed by the stuff my friends make and do. My father died in 1995, ten days shy of his 50th birthday. I wasn't very close to him at the time; our relationship had grown strained over the last few years of his life. But in recent years, I've become more and more sentimental about all the stuff he knew and did. A few years ago, I realized that nobody in our family actually owned a food grinder or a wheat grinder from the old Harvest Mills days thirty years ago. How was that even possible? I managed to track down a food dryer via Craigslist, but the wheat grinder was more elusive. 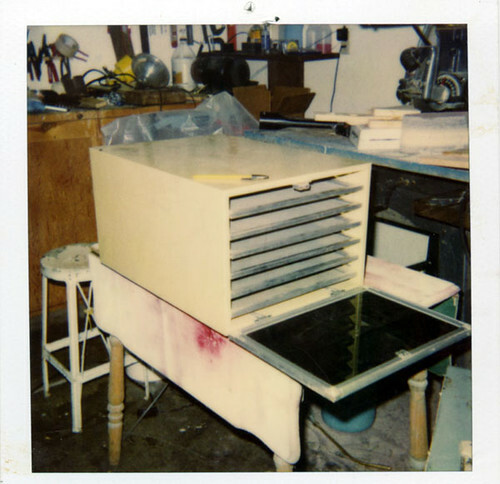 One of my father's first food dryers, made by hand. Then one day, we were scouring our favorite annual garage sale. And there, sitting on a table, was a Harvest Mills wheat grinder. I knew it instantly from its shape, even though I hadn't seen one since the 1970s. It was marked at $100. Being a frugal fellow, I tried to bargain with the owner. No go. He wanted $100. That was fine, though. I gladly paid the man the money. I would have paid $1000, if that's what it would have taken. Like most Americans, Kris and I own a lot of Stuff. Some of it, like the computer I'm using to write this post, is actually worth a fair bit of money. But you know what? None of it is worth as much to me as my father's food dryer or the painting of Kermit the Frog that Jolie just made for me. This computer (and most of the other stuff in my life) is impersonal and mass produced, but these other things were created by people I know. So, please: Make stuff. Don't just consume the things produced by others. If you don't already, try to find something that you enjoy doing, something that you can make by hand. Or make a homemade gift that will mean the world to someone. Don't be afraid to fail. When you make things, you make the world a better place. This is a guest post from MLR at My Life ROI. If you like this post, check out his website or subscribe to his feed. One thing I love about reading Get Rich Slowly is that J.D. is always willing to get his hands dirty and throw on a different hat. J.D. is a do-it-yourselfer. From writing monthly updates on his make homemade pumpkin butter and muffins, J.D. does it all! One DIY post caught my eye in particular, though. J.D. mentioned that the best way to save money on home repairs is regular maintenance. He mentions in the article that he met with a series of contractors to get quotes on things he did not want to do, like painting the house. The point was not that he met with a bunch of contractors — it was that there is a lot of value behind regular maintenance. J.D. did a good job making that point, so I would like to emphasize the other half of the equation: the value of getting a lot of estimates. Now, my parents are a lot older than J.D. and not as able-bodied. Maybe once upon a time they were, but they are not DIYers anymore. They recently decided they needed a lot of work done on their house. What did they need done? Back deck — Our back deck was in slight disrepair. Back when I was in high school and college, I would do what I could to help keep the house up and running. I actually paid my way through college by running an exterior painting company. So with that skill set came the familial duty of power washing, scraping, sanding, caulking, glazing, priming, staining, sealing, and painting different parts of the house. One thing I never got really good at was wood replacement and wood repair. I normally subcontracted that kind of work out when I was running my company. A bunch of the slats and fencing were rotted on their deck. Underneath the deck, a few of the support beams were also starting to rot. Seems they had termites. On top of that they had a storage shed right next to the deck which was getting decrepit and was only storing old lawn chairs and Halloween decorations. Phew! Lots of work! Carpeting (full house) — My parents moved into their current residence in 1988, a full 21 years ago. The wall-to-wall carpets have not been changed since then. They made do with what they had and would steam clean them to keep them looking nice enough. But now that the economy is tumbling, they decided they would be able to find some good quotes on carpet replacement. The catch? They didn't want to move any of the furniture, so any quote would need to include moving the furniture from the room, and putting it back after replacement. Kitchen Revamp — Similar to the carpets, the countertops and cabinets have been the same for the past 21 years. I stripped the wallpaper and painted the walls and cabinets about five or six years ago. The appliances have been replaced because of wear and tear. Other than that, nothing has really been changed in the kitchen. So my parents wanted a quote on completely tearing out and replacing the countertops and the back wall, repainting the walls, changing the cabinet hardware, repainting the cabinets, and tearing up and re-tiling the floor. So there we have it: three huge jobs that my parents wanted done in the middle of an economic recession. Good thing they've saved money for opportunities like these. 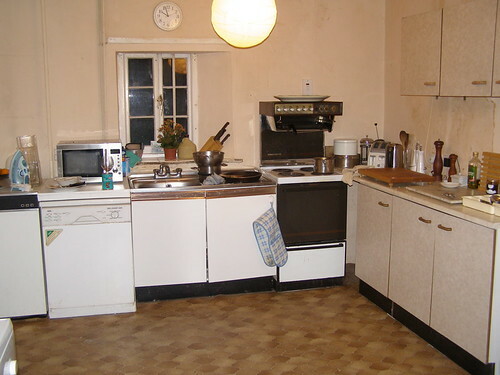 A kitchen in need of a remodel — but not the kitchen in this article. My parents went through the normal routine in order to get estimates. They called people from the phonebook, they looked at the local classified advertisements for services, and they asked some neighbors for referrals. When all was said and done, how much were the estimates? Back deck — The highest estimate they received for the back deck was about $10,000. They had a few other estimates ranging from $7,500 to $8,800. The highest estimate they received was also the first estimate they received. If this isn't a testament to getting multiple estimates, I don't know what is. But they did not sign with the contractor who gave a $7,500 estimate…it gets better! Carpeting (full house) — Estimates for the full carpeting job were as high as $6,500 and stayed in the range of $5,500 through $6,500. Why? Each contractor stated that the estimate was a lot higher due to the request that they be responsible for moving the furniture. Understandable…that is a lot more work than they were probably expecting. But my parents did not sign with the $5,500 estimate. Kitchen revamp — For the kitchen work my parents also got an estimate from a Home Depot-certified contractor on top of the other contractors that came in. The top estimate wound up being $3,800 and the lowest was $2,900. Surprisingly the Home Depot contractors were in the middle. Once my parents got all of their estimates, they figured that the maximum they would spend would be about $20,300 by choosing all of the highest estimates. If they chose all of the lowest estimates they would spend about $15,900. Not too shabby…that is a $4,400 cost savings, or 21% off! My parents were ready to go ahead and spearhead all three projects by going with the three lowest estimates. However, I would like to point out that they called the references for all of the lower estimates and all of them checked out as doing excellent work. I would never advocate just going with the lowest estimate to save money as you could wind up having to do a lot of “cleanup” work down the road. They asked me why there would be such a disparity, and in my experience from working in the industry, it is very whimsical. Luckily for my parents, though, they decided to not squeeze the trigger yet. They knew the neighbor across the street was a big time DIYer. Over the years we have watched him build his front porch, repave his driveway, build an in-ground pool, build a two level deck in the backyard around the pool, cut down trees, plant trees, build a shed, repair his foundation, replace sections of his roof, etc. I said J.D. does a lot… but compared to our neighbor I would venture to guess J.D. is an amateur! [J.D. 's note: There's no question I'm an amateur. Very much so!] What line of work is our neighbor involved in? He is a high school teacher. My parents decided to talk to him just to see if the prices were in line with the amount of work that was involved. They figured that he, of all people, would know how much time and equipment these three jobs would require. When they asked him they got a much better response than they imagined. Back deck — For the back deck he offered to do the job for $1,200, materials included, as long as he could spread the work out over a few weekends. He would also put a few more support beams in to be safe. Potential savings = $8,800 off of the highest estimate and $6,300 off of the lowest estimate. Carpeting (full house) — He didn't offer to do this work. However, he did have a licensed contractor he has worked with before that came out and did an estimate. Their estimate? $3,800! After checking their references my parents found out they passed with flying colors. Potential savings = $2,700 off of the highest estimate and $1,700 off of the lowest estimate. Kitchen revamp — The neighbor offered the same deal as on the back deck. He would do the job for $1,200, materials included, as long as he could do it over a long weekend, like a Friday to Monday. Potential savings = $2,600 off of the highest estimate and $1,700 off of the lowest estimate. They weren't expecting this at all so it came as a very pleasant surprise. It also goes to show you that you can save thousands in places where you would least expect to look. By talking to this neighbor they wound up paying him $2,400 for two of the jobs and $3,800 to the contractor he recommended for a total of $6,200. They saved anywhere from between $9,700 (61% off of the lowest estimates which were already 21% off of the high estimates!) and $14,100 (69% off of the highest estimates). Is this anecdote applicable in your own life? Absolutely! Do you ever see one of your neighbors doing a lot of DIY work? When you talk to them do they talk about all of the weekend projects they have lined up for themselves? If so, would it hurt to ask them if they would be willing to do some side work for extra cash? If not, do they know anyone who would be looking for work? As long as you are willing to be flexible with the schedule (as my parents were in letting the neighbor do the back deck work over the course of a few weekends), you may find a few thousand dollars in your bank account when all the work has been completed. If you can't find a DIYer in your neighborhood at least make sure to ask around for references from your neighbors and get multiple estimates done. If you can't save roughly $14,000 like my parents did you might be able to save the $4,400 (21%) they were about to “settle” for. 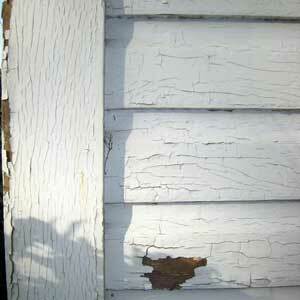 As the weather keeps getting nicer, good luck getting your home maintenance projects completed! J.D. 's note: Kris and I have had a LOT of work done on our house over the past five years, and I want to echo some of the things MLR has mentioned. Namely, the lowest bid is not always the best option. It's very important to take into account references and your rapport with the contractor. We have friends that always take the lowest bid and are then angry that things go wrong. Kris and I sometimes take the lowest bid, but sometimes we take the highest. It all depends on how well we think the contractor understands our objectives and on our assessment of his work. But would we ever hire a DIYer from the neighborhood? I guess it depends on how good her work was on her own place. Kitchen photo by Yew Tree House. Deck photo by DNA Michaud. Berry season is beginning in Oregon. 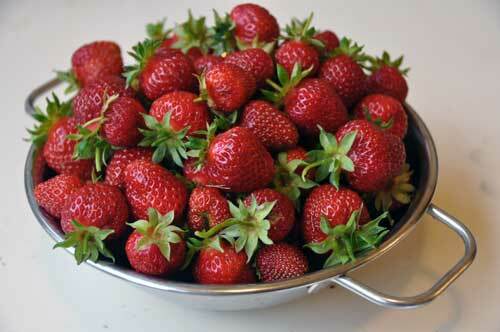 Strawberries ripen first, and they're followed quickly by raspberries, blueberries, currants, and blackberries! While these berries are ripe in your area, prices can be so low (especially if you pick them yourself) that you'll want to stock up. But what should you do with all of that fresh fruit? Here are three techniques to make those berries do double duty (now and later). These methods are so easy that it's just silly not to use them. The secret to freezing berries whole is to freeze them first and then pack them. Find a cookie sheet that will fit in your freezer. Line it with waxed paper, and load it with clean, de-stemmed berries in a single layer, spacing them so they're not touching. Freeze until solid (an hour or two), and then pack into freezer container or Ziploc bags. Doing this will prevent the berries from clumping together and forming a solid mass, which will allow you to use just the amount you want without thawing them all. You can usually get away with skipping this step with blueberries; they have a natural waxy layer than helps keep them separate. Whole berries from the freezer are perfect for making smoothies. Don't thaw them — they'll function sort of like berry-ice cubes to chill the smoothies as they flavor them. I like to combine lowfat vanilla yogurt, over-ripe bananas, frozen berries, and a bit of fresh-squeezed orange juice. Thawed, whole berries make wonderful cobblers and crisps. I freeze some bags intended for “mixed berry cobbler”. As different berries ripen over the season, I freeze them and add a bit of each kind to the bag, creating a mixture of berries that is ready to thaw and bake. I generally don't sweeten mine as I freeze them, but if you know you'll be adding sugar for a particular recipe later on, you can add it now. The sugar helps the berries survive the cold storage. Berry purée is wonderful drizzled over vanilla ice cream or other desserts such as cheesecake, poundcake, or angel food cake. 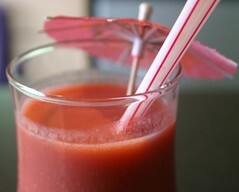 But my favorite use for purée is to make thirst-quenching berry lemonade. I prefer not to mix berries for this, as I like the unique flavor of each. For each 12 ounces of frozen lemonade concentrate, you'll need about 2 cups of berry purée — plus sweetener and/or lemon juice to suit your taste. With your blender, simply purée the berries (use strawberries, raspberries, or blackberries), pour into a Tupperware (or reuse large yogurt containers), and freeze. With strawberries, I like to leave it a bit chunky. With seedy berries like raspberries or blackberries, I purée it and pass it through a sieve to remove the seeds before freezing. When you're ready to make the berry lemonade, simply mix the lemonade concentrate, the amount of water called for in the package directions, and two cups of berry purée (completely thawed, or partially thawed to a slush). Stir and taste. You may want to add a bit more sweetener (or fresh lemon juice if you like things really tart). Serves about 6. This mixture also makes great popsicles! You can also freeze the berry purée in ice cube trays and just add a bit at a time to drinks over the summer. Our strawberry plants started producing early this year! Some people (like J.D.) prefer freezer jam to cooked jam. It often has a softer texture, brighter color and fresher taste. And because it's frozen, there are never any worries about whether it's been safely canned. In addition, you can make freezer jam with little investment in equipment. If you have the freezer space, it's well-worth making the small effort it requires to whip up a batch. I try to make enough to last us 'till the next year's berry crop. Simply follow the directions on a package of pectin, or do a Google search for “berry freezer jam recipe“. Making freezer jam is extremely simple, and can take less than half an hour! Just be sure to stir your jam until the sugar is fully dissolved, or the crystals will give it a grainy texture. On a nippy winter morning, toast and homemade jam are a treat! Because of its soft consistency, you can also try zapping the thawed jam in the microwave for a bit and then pour it over pancakes, waffles, or thick French toast. Yum! You might even get hooked on freezer jam and decide to delve into other fruits later in the season. Stone fruits such as apricots, peaches, and nectarines lend themselves well to this technique. No matter what's ripening in your neck of the woods, try to preserve some food while prices are low. Buying fruits and vegetables that are in season is like finding a sale on produce. And purchasing locally-grown foods when you can helps nearby farmers, too. But the best reason is the taste: food allowed to ripen fully before it is picked just tastes better, so get out there and pick some today — then load your freezer with summer's bounty. Smoothie photo by Dannynic. Berry photo by J.D. This is a guest post from Tough Money Love, the personal-finance blog that doesn't pull any punches. You don't have to look far in our economy to find someone willing and able to assist with your financial planning. Bankers, insurance agents, stock brokers, wealth managers, and professional financial planners are everywhere. Advice passed along by personal finance bloggers and other amateurs is easy to come by as well. Many of those wanting to give you advice or manage your money are competent and focused on your best interests. Unfortunately, some are not. Separating the good advice from the bad advice can be a daunting task for anyone. That's why I am suggesting that many of us can (and should) be more actively involved in our own financial planning. Although a complete do-it-yourself financial plan may not be best for you, applying DIY energy to the overall planning process keeps you in front and in charge of your financial destiny. Professional services are not free and financial planning is no exception. Whether you are paying commissions, fees based on assets under management, or fee-for-services charges, you are going to pay something. Fees that represent even a small percentage of your assets can be substantial. The impact of the fees is magnified over time and is particularly harmful in an economy where investment returns are depressed. That's where we are now and where we may remain for an extended period. If you do for yourself that which is within your realm of competence — and let a pro do only what you cannot — you will save money and come out ahead overall. Some financial advice you receive from others may be burdened by inherent conflicts of interest. For example, a stock broker or insurance agent makes a living by selling financial products to you. The advice may be “free” but you could end up buying something that is not best for your situation. If an advisor's income is based on what you buy or how much you invest, the temptation to give advice in that direction is hard to resist. Complete objectivity may be missing. That's where the DIY planner — you — steps in to recognize what is really happening. When you are advising yourself, all of the focus is on your money and on your money issues. A third-party advisor may be distracted by other clients and by personal needs. If most of those other clients have more money than you, they will likely garner most of the attention. The wealthy receive custom solutions. The not so wealthy often receive standard recipe solutions. If you are more involved, you can determine if a proposed plan or solution for your money problems is really designed for your unique circumstances. J.D. 's note: Remember — Nobody cares more about your money than you do. Perhaps the biggest variable in providing appropriate financial advice is adapting to the client's tolerance for risk. I have seen dozens of different questionnaires designed to ascertain a person's financial risk profile. The problem is that this is a highly subjective metric, heavily influenced by emotion. The best person for understanding how risk tolerance will affect your sense of money well-being is you. That's worth a lot. Most financial planning decisions are made for the long haul. Others are made in response to internal and external conditions. Some of those conditions can change rapidly, as we have seen in recent months. A third-party advisor with hundreds of clients may find it difficult to keep up with all of the changes that affect you or promptly react to them. You won't have that problem. If you are crafting and following your own financial plans, you will have a more intimate knowledge of how your behavior as a consumer affects those plans. This makes you a better consumer thereby improving the prospects for a successful plan outcome. Politicians have a lot of control over your financial destiny. Many voters lack real knowledge of how government spending, taxes, and budget deficits will affect them personally. If you are deeply involved in your own financial planning, you will better understand how monetary and fiscal policies impact your plan. That will make you a better voter. We need better voters. If recent economic events have taught us anything, it is that we must be personally responsible for our financial future. Depending on government or Wall Street has not worked. Turning everything over to a third party can be just another way of passing the buck — literally and figuratively. Having someone to blame for money misery doesn't get your money back. So keep the ultimate responsibility at home. 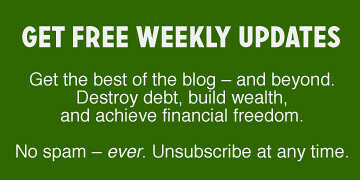 I am not suggesting that DIY financial planning is for everyone. If you are a high net-worth individual there can be complex estate and tax planning tax issues that require professional guidance. If you are already in financial trouble, that may signal a need for third-party intervention. If you are unwilling to read, study, and read some more — constantly — then don't bother with your own financial planning. If you cannot prepare your own tax return, track your spending, or monitor your portfolio performance, you are probably a poor candidate for self-directed money management and investing. That's okay. But at least give the idea of being more involved in your own financial planning some serious consideration. You may be the best candidate for the job or at least to play on the planning team. To get you started, here are some ideas on how to be your own financial planner. Given a garden tool or a kitchen gadget, I can usually find success. But I have neither the talent or inclination for wiring, plumbing, or carpentry. I come from a long line of un-handy people, too, so there's no phoning home when the car's making a funny noise or the garbage disposal is on the fritz. 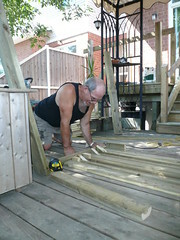 And, unfortunately for me, I also married one of the un-handy (although, to be fair, J.D. tries his best). In our lifetime together, we have spent more than our share of money and time on projects that would seem simple to those with even rudimentary repair skills. However, we are getting better. Part of it is that we now live in a house with lots of “character”. Things break. One day, the cold water in our upstairs bathroom sink wouldn't turn off. I don't mean that it was dripping; I mean it was full on. This was approximately two months after we moved in. It was at this point that I realized that we either need to learn, or have a very large home emergency fund — or both. I also realized that, in most cases, it's not the end of the world. So, here's what I did this week. You might even call it handy. On Saturday night, I baked pancetta-wrapped halibut for dinner. This recipe calls for a higher oven temperature than most: 550 degrees F.
On Sunday morning when I went to make blueberry scones (while listening to the Car Talk guys, perhaps two of the most handy people on the planet! ), I noticed that the top oven of our double oven wouldn't preheat. Luckily, I could use the bottom oven to prepare breakfast, but I was annoyed. Did I burn out the element? Then I realized we have a gas stove — there's no element. Did I burn out something else? When I tried to preheat and failed, was I pumping natural gas into the kitchen, potentially creating a fireball scenario? The stove is only four years old, and, of course, we did not buy the service contract or extended warranty. I pulled out the owner's manual and flipped to the section for troubleshooting. “Oven not heating” was not on the list. Time for Google. I typed in my range's make and model and “troubleshooting”. Nothing really helpful came up, but I eventually navigated to a site called Just Answer. I type in my question and how much I'm willing to pay for an answer from one of their site's experts. Once I received the answer, I could decide to pay the amount or not, based on how helpful it was. I thought this was an interesting business model — I decided to give it a try. I “bid” $15, the middle choice from a set of options, and wrote my question, giving make/model info, symptoms, the question about my safety concern, and the 550 degree factor. I submitted the question — and waited. Twelve minutes later, “appliance Doc” answered. A real person, who answered me specifically, and told me exactly what I wanted to know, even explaining why gas was not flowing: an ingenious safety feature design that makes perfect sense. The answer also allowed a chance to ask a follow-up, so I inquired about how easy it would be to replace the faulty part, the gas ignitor, myself. A few more minutes elapsed and a reply came with more details and a link to the part number I needed. Could I have found this information without the online expert, by just continuing with my own online research? Maybe. Eventually. A handier person may have been willing to do that. But what this expert did for me was give me the confidence to go downstairs, dismantle the oven, conduct the test to confirm his (or her) diagnosis, and remove the faulty part. I now knew there were two kinds of ignitors, and I knew which type I needed, and I knew about how much it should cost. And I knew that the replacement should be manageable, even for me. Armed with this knowledge, I was eager to make the repair myself and could target further Googling now that I had a name for the problem. It sure beat scheduling, and paying for, a repair person to come to the house. Ah, the marvel of the internet — and a burst of personal empowerment. J.D. picked up a replacement part Tuesday and I put it in Tuesday night. No swearing. No fighting. The oven works, and I spent $67.50 plus about two hours of time to make it happen. I was so excited that I updated my Facebook status, crowing about it! I also learned a lot more than I knew before about just how a gas oven functions, and that I can easily remove the oven doors when they need a cleaning. The next time this part goes bad (every 5-8 years with normal use), I'll know exactly what to do. I'm hardly handy, but I'm learning! 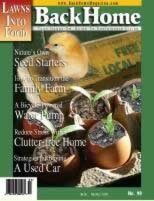 When I wrote about homesteading magazines in February, several people praised Countryside as the best of the bunch. Intrigued, I subscribed. I've received my first issue and I have to say: I'm impressed. Countryside isn't for everyone. It's very much geared toward those interested in getting “back to the land”. When I read the magazine, I couldn't help but think of my father. He loved this sort of thing. But even though I live in suburbia, there was still plenty of interest for me, as well. I want to share an idea with readers, as we are all facing pretty freaky economic times. I know folks who knit, but don't can food, or make soap or go fishing or have a huge garden, etc. Many of us have skills or abilities to share, so we get together about once a month and have a “Swap-Luck”, where we all bring something we've made, grown, grown out of, or a skill to trade with each other. These are so fun! Our group is slowly growing to include others now too. The last one had a dozen folks with pizza dough, goat milk, habanero peppers, fresh granola, kimchi, wine, soup — there's something for everyone! I'd highly encourage others to try this; it really encourages you to try new things, make creative foods or products, and doesn't involve money. And it builds community as well. Our SwapLuck group has over twenty folks who come and go, but started with a handful of friends. Friends tell friends, and so it goes. We get together about every two weeks. Last summer I read this fantastic book called The Revolution Will not be Microwaved, by Sandor Katz. He described these underground groups who get together and trade things that may be your specialty, but the financial overhead and burden to do what you love for a living (and up to code) is nearly impossible. But you love to do it anyhow. There's all kinds of stuff! We all bring as much as we want to trade — no limit or restrictions. And if people like what you make or have brought, they swap with you (as long as you have something they want.) We all have our specialties, and the group is ever-evolving. People try new things all the time. That was part of the incentive, so we'd all be inspired to try making new things, knowing we had a ready audience. Over the winter, we met at a local bakery/coffee shop. Now that summer is coming, we'll return to meeting at people's homes. It is amazing at how business-like we are about it. Sometimes it's like a party afterwards, but the swapping comes first. At each swap we always decide as a group when and where the next is. That way the communication doesn't have to be on one person's shoulders. We are mostly all on Facebook, so if someone misses one, it is easy to find out where the next one is. Our typical swap would be at 5:30pm. We wait til 6pm, then one-by-one we go around and describe what we have brought. Then after everyone has their time, swapping begins. It is first-come first-serve, but second swaps are not unheard of! By 7pm we are usually done swapping. The one rule is “pre”-swapping is not allowed — like you see something good, you can't interrupt and say “I want that and I have this to swap!” That is our only basic etiquette rule. Swaps on “futures” happen all the time. Maybe you only have one batch of cookies, say, but you could promise a fresh batch to trade. This is all based on trust, and we have found it has built an incredible community as well. I'd say the hardest thing to swap is services — and I am not sure how many of them have been swapped. The people offering services put it out there, but I am not sure if much has happened outside of the swap. On a semi-related note, check out this article from Yahoo! Green about how swapping is shopping for the new economy. That's overstating things, of course, but I've heard of a lot more people swapping lately. In some parts of the U.S., vegetable and flower seeds can be successfully planted directly into the garden. But in many areas, the growing season is too short to allow this. 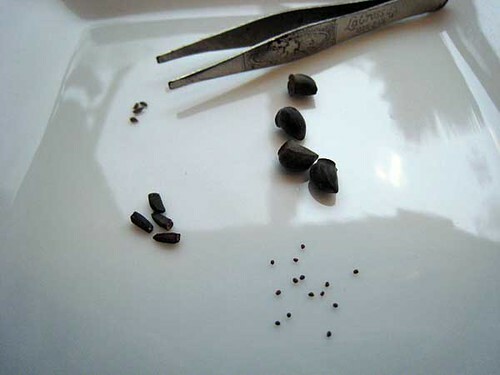 Cool spring soil temperatures and cold weather can prevent seeds from germinating or kill young seedlings. If you wait until the weather warms, the plants get off to a late start only to be zapped by fall's first frost; they don't get a chance to bear a full crop or to put on a full floral display. Buy all of your vegetables and flowers as plant starts, once the weather warms. Extend the growing season outside with coldframes and rowcovers. Start your own seeds inside while the wintry weather lingers. The first choice is best for beginning gardeners who are working on a small scale. The second option is nice for committed gardeners who want to test the limits. Starting from seed, however, is easy, is cheaper per plant and allows a greater variety of choice among both ornamentals and crops than buying nursery plants. In order to decide when to sow your seeds, you need to find the average last frost date for your region. In Oregon's wet and unpredictable Willamette Valley, published last frost dates range from March 23 to May 14. Based on my own experience, I pick the latter end of this range and count backward from May 1st. Click for full version of our 2009 seed-starting agenda. I start my tomato plants six or seven weeks before this date. Slow-to-germinate flowers get an eight-week head start. Squashes and cucumbers don't transplant especially well, but I germinate them inside to protect them from marauding slugs. I move them outside two weeks later before they've developed much of a root system. To determine what to plant indoors, read your seed packets. 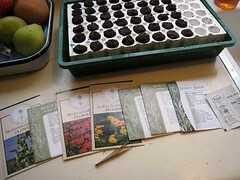 Many will list instructions for both inside and outdoor seed sowing. Knowing which to do will depend on your climate. With flowers, I often do both. I'll start a limited number indoors for “insurance” and then sow the remainder of the packet directly in the garden once true Spring arrives. Tomatoes and peppers, broccoli, eggplants, cauliflower, melons and squashes can all be started successfully indoors. Herbs and flowers, too, benefit from the controlled environment of indoor seed starting. Let's get started! The two most important factors for seed germination are temperature and humidity. The seed contains all the nutrients the plant needs to germinate, so it doesn't need fertilizer or fertile soil. To start my seeds, I used the bio-dome from Park Seeds, a device that looks like a plastic greenhouse dome with a styrofoam tray. 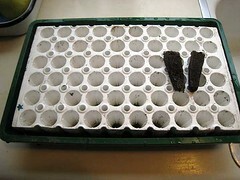 The tray holds little soil-less planting plugs called bio-sponges. Each plug has a hole in it for the seeds. I don't normally advocate one product over another, but I really like these. Seeds sprout best in a light soil; don't use potting soil or garden dirt at this first stage! You can buy seed starting mix or make your own from peat moss, sand, and compost. Note: Take care if using vermiculite; it can be a respiratory hazard. I prefer the little soil-less planting plugs because they're mess free and they pop out easily for transplanting, doing minimal damage to the roots, but other methods work fine too. Any device that keeps the environment moist and fairly warm will work. You can cover trays of soil with saran wrap or a dry-cleaning bag — poke plastic forks into the soil to hold the plastic layer up off the growing sprouts. Commercial peat pots, yogurt cups or milk cartons (poke drainage holes in the bottoms) or pots made from newspapers (avoid colored ink) all work fine, too. I usually put two seeds into each hole. I use three if I think the germination rate will be low. You can test your germination rate by placing ten seeds between layers of moist paper towels in putting them in a Ziploc bag in a warm place. 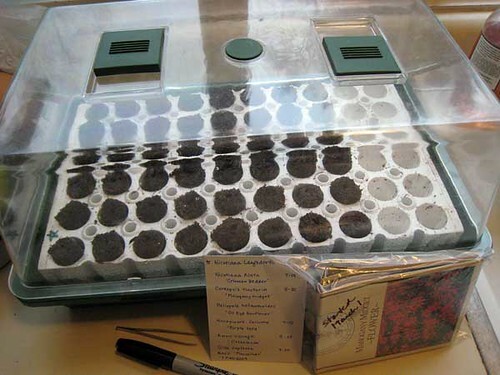 This is a good idea if you have saved the seeds yourself or they are several years old. Do this 2-3 weeks before you want to actually start your seeds. As you're planting, take good notes! Make a planting diagram and jot down how many days it takes each type of seed to germinate. Some germination times are given as huge ranges (5-20 days). The happier the seed is (warm and wet), the speedier germination may be. 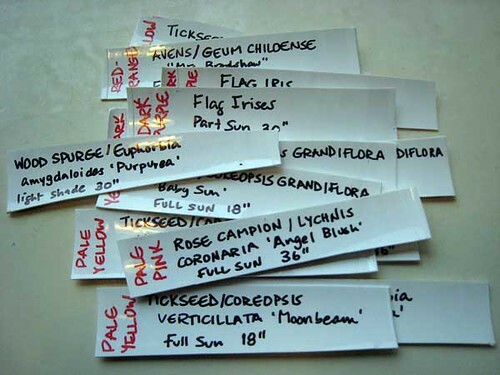 If you are using individual pots, mark them with labels or masking tape, unless you know for sure that you will recognize what the leaves of your young plants will look like. There's nothing worse than getting your plants mixed up. This is especially important if you are starting different varieties of the same crop! Free plant stakes can be made simply by cutting up a plastic yogurt tub. Store your leftover seeds in a ziploc bag or glass jar in the refrigerator. Now that the seeds are snug in their beds, cover them to retain moisture and put them in a warm place. A temperature of 70 degrees Fahrenheit (21 degrees Celsius) is ideal, but in March our house is nowhere near 70 degrees! I like to set my mini-greenhouse on a heating pad (a wet/dry safe heating pad set on low) to maintain a more constant temperature, since our thermostat drops to 54 degrees (12 Celsius) at night. Some people recommend putting the seed tray on top of the refrigerator. If your house is more temperate, the heat source is unnecessary. I have often started seeds without a heat source, but peppers and eggplants seem especially fussy about the temperature. Once the seeds have germinated (keep them moist! ), they'll need light, nutrients and air. 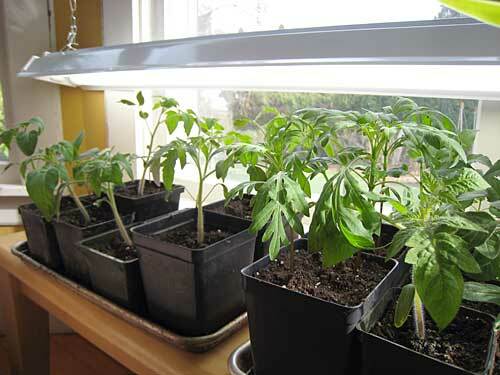 Give them some ventilation and move them to a very sunny window, supplemented with artificial light. There is no need to buy an expensive grow light or full spectrum light. For these purposes, a basic 48″ fluorescent shop light is all you need. Tip: The type I own has two tubular bulbs per light; they're available at home improvement stores for less than $20. The critical thing is to hang them in such a way that they can be raised as the plants grow; I use a link-type chain that can be doubled-up on itself to different lengths. As your plants grow, keep the light about 6″ from their tops. If the light is too far away, the plants will grow spindly as they stretch for it. This can be rather tricky if you are starting different types of seeds at the same time, because they will grow at varied rates. You can lift the shorter ones with shoeboxes or phonebooks to alleviate this difficulty. 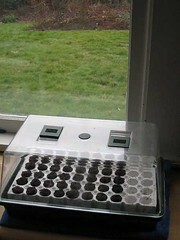 Once all the seeds in your tray have germinated, remove the cover completely. Too much humidity at this stage can encourage mildew and harm the seedlings. As you water, fertilize with a weak solution of water-soluble all-purpose fertilizer. I make mine about one-quarter the strength called for. Watch out for crystallized salts forming on your soil surface — that's a sign you're over-fertilizing and need to cut back. Turn the lights off for your plants at night (they need a dark cycle to grow properly) but leave the heat on (temperature fluctuations can stunt them). When the seedlings first sprout, they will usually have a pair of first leaves that look nothing like the true leaves that come later. (Many crops are dicots, but not all.) Watch closely, and soon after they have two sets of true leaves, it's time to move the teenage seedlings into their first real apartment. Water your seedlings thoroughly an hour or two ahead of time, and then, working carefully and quickly, remove each seedling into its own pot. At this point I generally use an all-purpose potting soil. Scooping them up from below, try your best to get all their little roots, and handle their tops as little as possible, and always by the leaves, rather than the stem. A damaged leaf can be replaced; a damaged stem often dooms a plant at this stage. Depending on how long your plants will be living inside, you may perform only one transplant, or you may need two. For my tomatoes, I'll move them into 4-inch plastic nursery pots first, then into gallon-sized pots before they go outside. Everything else gets one transplant, then into the garden. Once your seedlings are thriving, it's tempting to treat them a bit too carelessly. Being started inside in a safe environment, they can't stand the shock of an immediate change in their conditions. Basically, they are weak, coddled little things. Expose them gradually to the out-of-doors by setting them outside on nice days for a few hours, being sure to bring them inside at night and making sure they don't get sunburned or blown over. Some gardeners like to have a fan blow on their indoor starts, saying it strengthens the stems to withstand windy outdoor conditions. I can't vouch for that, but I do think it helps prevent mildew. Wow, that seems like a lot of work when I write it all out. But it's not really! Watching my garden plants grow from tiny seeds is a thrill every year. I love trying new things each spring and learning from my successes and failures. I hope these tips get you well on your way to learning what works best for you. Happy gardening! 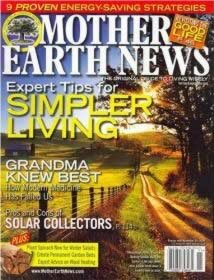 When I was a boy, my father used to buy Mother Earth News from the grocery store. The magazine was filled with stories about self-sufficient country living, the sort of thing my dad aspired to. I'd read the magazine after he was finished, but never really understood the appeal of building your own greenhouse or raising goats. Now, as an adult, it makes a little more sense. Though our own adventures in self-sufficiency are limited, they're edifying, and I admire those who do even more. I'm a strong advocate of the DIY ethic. I believe there's real value in traditional skills, such as gardening and sewing, canning and carpentry. As a bonus, most of these practices save money. Mother Earth News is “the original guide to living wisely”. Its content leans left, and includes articles on subjects such as renewable energy, green homes, organic gardening, green transportation, and sustainable farming. BackHome is “your hands-on guide to sustainable living”. It covers topics like owner-built homes, backyard livestock, rural heritage, green building, and country skills. Backwoods Home, is like the first two publications in this list — but with guns. Backwoods Home leans right (or libertarian), and offers “practical ideas for self-reliant living”. 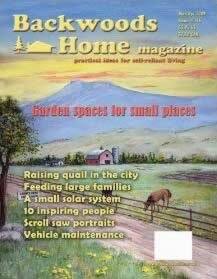 Like BackHome, it offers how-to articles on owner-built housing, independent energy, self-employment, and country living. And there's a regular column on gun ownership. I am not a libertarian, and I'm ambivalent about guns, but after looking at the website, I think I'm going to subscribe to Backwoods Home. This magazine looks awesome. 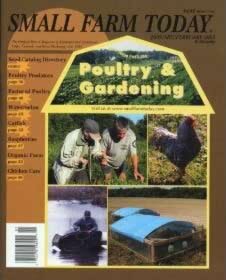 Small Farm Today is “the original how-to magazine of alternative and traditional crops and livestock”. According to Amazon, this publication discusses “alternative and traditional crops, livestock, and direct marketing, designed to help make small and family farmers profitable and sustainable”. The Small Farm Today website doesn't provide much useful content, and offers no glimpse of what a typical issue features. It does provide farm links, an events calendar, and online classified ads, but I'd rather see some past articles so that I could know if I'd find it useful. 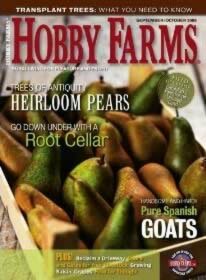 Hobby Farms is a magazine about “rural living for pleasure and profit”. Its marketing copy says that it “embraces the growing segment of population that is returning to farm life in search of a more meaningful existence”. 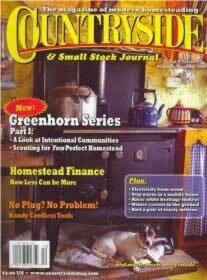 Countryside & Small Stock Journal is “the magazine of modern homesteading”. It features articles on constructing a homestead, the homestead as a business, the country kitchen, and self-reliance and survival. Here's a long list of past Countryside articles for future reading. Looking at the contents of these magazines makes me dream of things I can build and grow. I don't subscribe to any of them right now, but may have to begin picking up a few. Or maybe I'll just start checking out their websites regularly. Do you read any of the these? Do you know of other magazines for people who want to practice self-sufficiency? What about books? I'd love to build a small library devoted to the subject. In 2004, Kris and I bought a hundred-year-old farmhouse. We'd been living in a 1976 ranch-style home that was virtually maintenance-free. We knew that our new house was quirky, and that it needed some remodeling, but we didn't quite understand the extent to which maintenance would dominate our lives. Every summer, we've had a major project. Or two. This year is no different. This is an extreme example from one corner of the house. There's a lot of work to be done. As always, the prospect of the time and money involved to patch things up makes me glum. It seems as if there's always something new that needs attention. The national statistic on the Cash Value of Home Maintenance states, for every $1 that is spent on maintenance, up to $100 of repairs are avoided. In my experience as a professional home inspector, I have looked at hundreds of homes in all age ranges, and I have seen thousands of dollars of damage to homes that could have been avoided by spending $5 to $10 and just a few minutes of work. On Friday we met with a series of contractors. We stood outside in the bitter cold, climbing ladders and pointing out the things that need to be repaired. We may be able to handle some of the things ourselves (the gutters, for example), but others either require a professional, or are things we're willing to pay for. We could paint the house, for example, but we know ourselves. If we start the project, it'll take forever, and it won't be done as well as a pro could do it. When we moved into this house, our home inspector recommended that we create a home-maintenance checklist. I'm beginning to understand the wisdom of this advice. Fortunately, the previous owner — who lived here more than 40 years — drew up a list of chores and organized them by month. This weekend, we modified this list (adding and subtracting items), and included ongoing projects. Now we have our own home maintenance checklist [36k PDF]. The Mississippi State University Extension Service home checklist is outstanding. The National Center for Healthy Housing also has an excellent checklist. I have a dream that someday in the future, we'll be done with all of the maintenance and repair. Someday we'll have a summer without a home-improvement project. I just don't think that someday is coming any time soon. For now, we'll continue to tackle the most urgent projects as we can afford them. And we'll console ourselves with the knowledge that an ounce of prevention is worth a pound of cure. Tip: My biggest piece of advice for saving money on home maintenance? Don't buy a hundred-year-old farmhouse!